Wide range of units and opening types. Optional burglar, fire and bullet resistance. 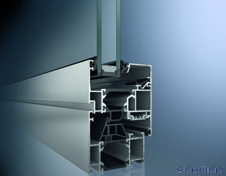 AvanTec - concealed hinges for vent weights up to 130 kg. Maximum energy efficiency and reduction of solar heat gain. Elimination of corner leaks utilizing vulcanized gaskets. No center post in double sash options for un-obstructed view.